Friday was happy Vudu landfall of the vastly underrated John Ford thriller Gideon's Day, streaming for a first time in high-definition and looking like a million. 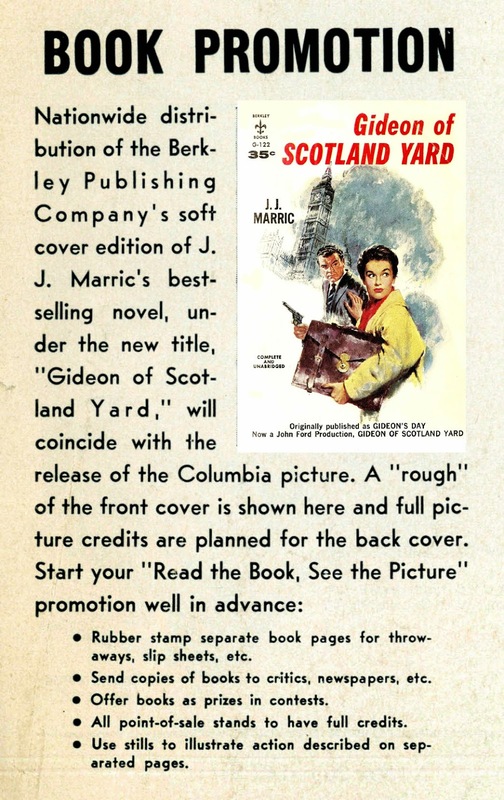 Actually, it cost half that to make in 1957, a show Ford looked back on as a lark, but that may be because Gideon (retitled ... Of Scotland Yard for stateside release) more or less thudded over here, but what's this myth that Columbia chopped it down to 55 minutes? Every trade reference I checked said 91, as well as the pressbook, so trims beyond mild profanity are unlikely. Besides, what we've got streaming and on DVD is the full-length Gideon's Day of UK origin, bearing that original title. Further query: Did Columbia "dump" Ford's film as attested by writer/historians since? My impression says mostly yes, for reason of delay in US-exposure (nearly two years) and fact of Columbia supplying black-and-white prints to domestic dates, an egregious slip considering fact this is among loveliest Technicolor jobs out of late 50's England (as photographed by famed F.A. "Freddie" Young). 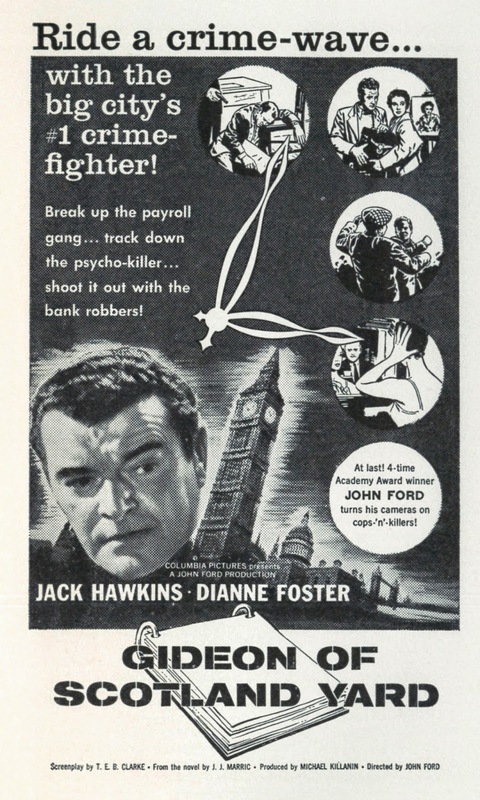 Columbia had announced Gideon Of Scotland Yard for May 1958 domestic release, but that season was crowded with others from Brit-Columbia partnership --- Revenge Of Frankenstein, The Camp On Blood Island, The Snorkel, Curse Of The Demon, etc. Variety had in April called Gideon "an orthodox, but expert film, which promises satisfying boxoffice results." Revised scheduling would bump Gideon to February 1959, however, where it ping-ponged between first and second position on bills. Business wasn't notable in either event. "Getting no place" was Variety's verdict when it played with Samuel Fuller's Verboten! in Buffalo, result a "sad" $3500 for a first and only week. NYC waited until May 19 for premiere at the Odeon, just off eight weeks of The Shaggy Dog. Gideon Of Scotland Yard stayed there, singly, for a "fair" ten days to $12K receipts, eased out by a revival of From Here To Eternity. 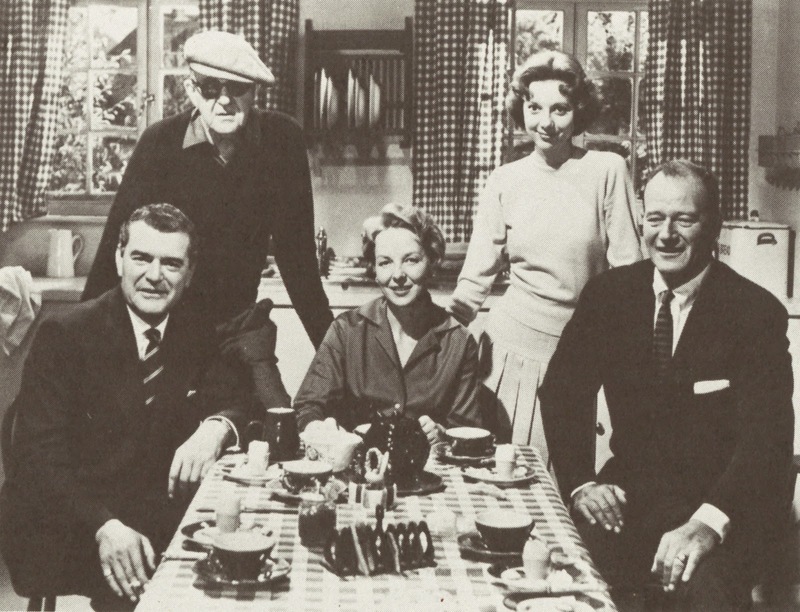 Gideon would later go to TV syndication, again black-and-white only, among 60 "Post-50's," in May 1964. 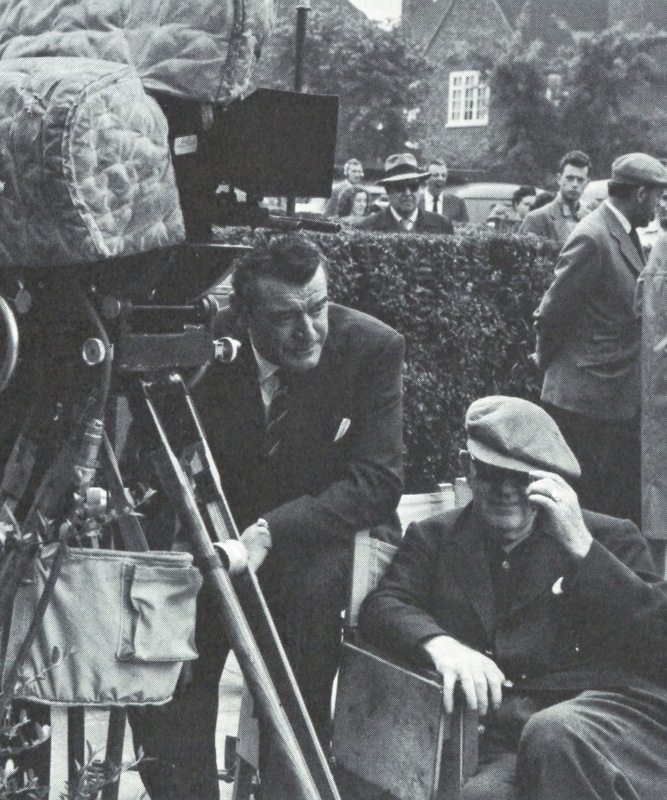 Was John Ford's name meaningful to Columbia selling? 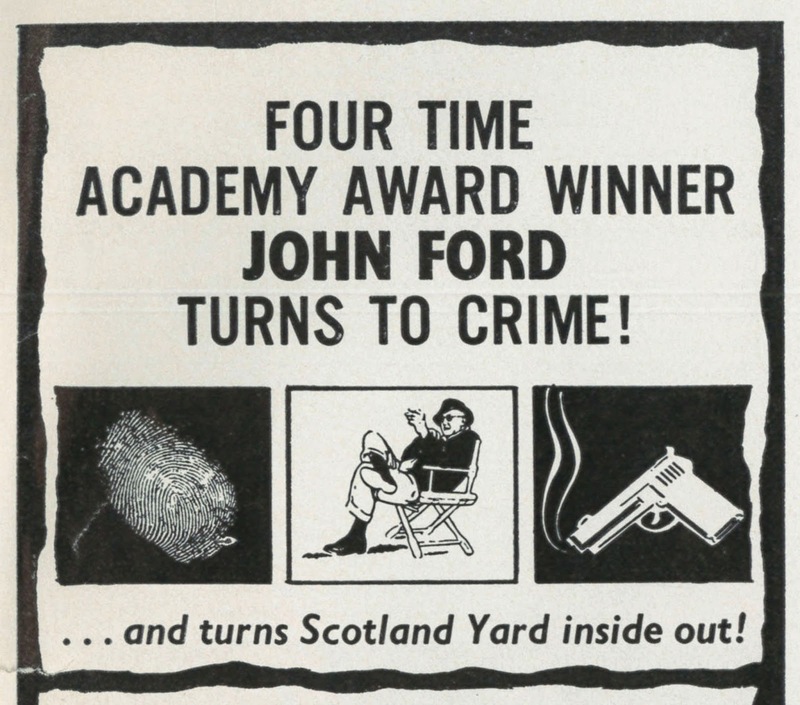 Some ads and most poster art ignored him, Gideon Of Scotland Yard being offered on action terms, but mats were available to emphasize "Four Time Academy Award Winner" Ford, whose first time this was directing a crime thriller. That last was honest enough advertising, being JF's sure enough first go at police procedure, a genre he made his own thanks to adroit way with performers and suspense they generate. There is expected Ford humor, but tension and violence too. 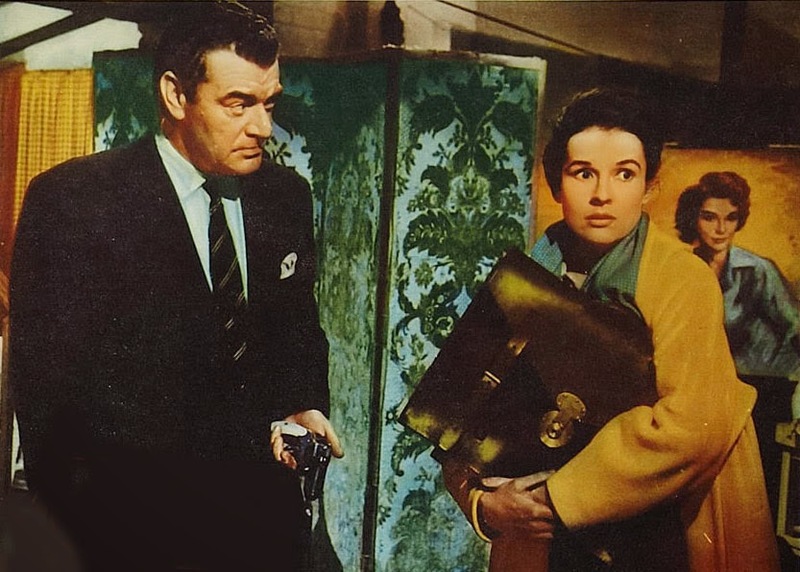 Jack Hawkins, terrific as always, was said to have been most appreciative of his director, while Ford seems to have been as affable on this project as any from autumn of his career. What Gideon demonstrates is how versatile JF could still be, and how responsive he was to Brit setting and idiom. Pace is as quick as one could hope for, half dozen at least narratives rushing toward resolution over a taut hour and half. Sets made evocative by Ken Adam design are augmented by well-chosen locations in/around London, including trains along the Underground and a crowded cinema that smacks beautifully of UK picturegoing. Here is a Ford you can show to, and please with, a general audience, this not necessarily the case with a few more celebrated of his. I'd have welcomed a whole series of Gideon actioners under Ford direction, and with Hawkins starring. The film is also available on DVD as part of a Ford set from Sony/Columbia, via TCM Archive. I saw this film around 1986 on TV, in color. However, it seems that only in a few countries Columbia presented it in Technicolor. But these ones from Italy and Germany don't mention Technicolor. Did they exhibited in black and white? This is very good information. Thanks. I was talking to someone yesterday about "Gideon," and we wondered if the film was ever US-shown in color before TCM began showing it a few years ago. That's certainly where I saw Gideon for the first time with color, let alone in its intended widescreen format.